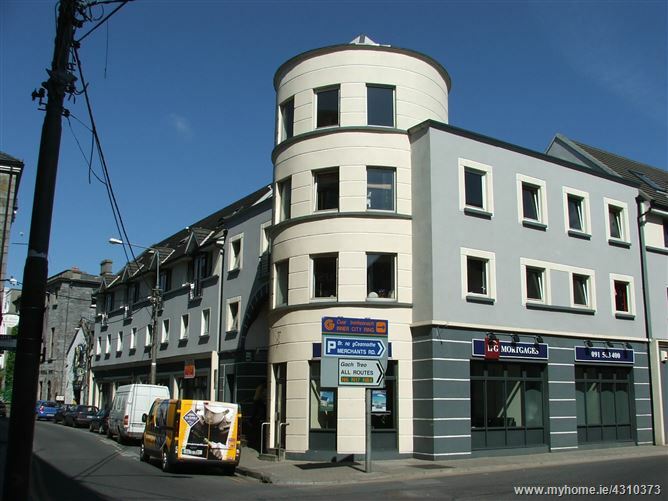 •	This is a top-class 3 bedroom City centre Apartment situated in Galway City centre at Flood St., Galway – within walking distance of every City centre facility on offer, also convenient to University and Hospital with easy access to Salthill Region also. •	ACCOMMODATION: Spacious Hallway, Sittingroom/Diningroom, Kitchen fully fitted, Mezzanine Area, 3 fantastic Bedrooms, en-suite off master Bedroom + main Bathroom w.c. and w.h.b. •	Come and see No. 1 – you will not be disappointed. A top-class 3 bed. Apartment in Commerce Court which is located on Flood Street in the City centre. A Duplex Apartment with a feature spiral staircase leading to a very bright mezzanine area. A fine livingroom/diningroom area, excellent fully fitted kitchen, 3 spacious bedrooms – one en-suite + main bathroom. A well run Development – Service Charge Applies – lots of natural light throughout. Within walking distance of every City centre facility – also convenient to University, all Bus Routes, Shops, all Schools and places of work. For location - this Apartment at Commerce Court has it all.